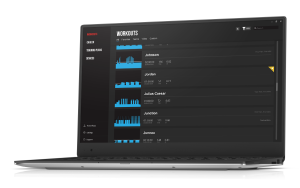 TrainerRoad is a training tool providing structured workouts. 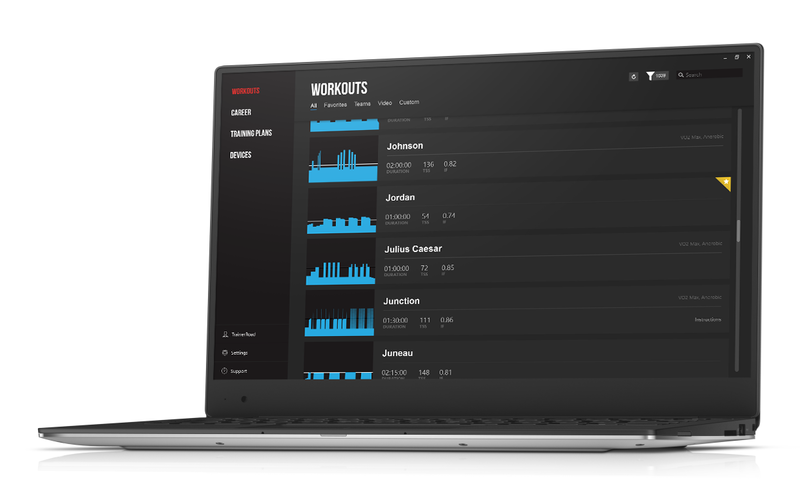 You can select from over 800 workouts or follow one of several training plans. You can select from a good selection of training plans depending on the amount of time you have, your fitness level and whether your a road cyclist, triathlete or mountain biker. The 6 to 8 week plans progress with Base, Build and Speciality. If you don’t have a ‘smart trainer’ you need an ANT+ or Bluetooth speed sensor. TrainerRoad have calculated the power profiles of numerous trainers and the App calculated your virtual power from your speed. Enter age and weight and used the power estimator. Entered weight and guessed at my fitness level being 8 = 198w 9=225w I would guess that it’s currently around 210/215w. Once underway, you have a target power to aim for and a countdown clock telling you how much longer is left till the next interval. This is positioned in the middle of the screen with your target power and actual power to the left, which means that you tend to focus on the time left rather than your power. And we all know how slow time passes when you’re watching a clock! I would prefer to have the power in the middle with the time in a more discreet location. To the right you have your heart rate and cadence. Either side you have two graphs: one sowing where you are in the workout and the other showing where you are in the interval. If you have the graphs, I don’t think you really need the clocks. After a few workouts I cut out a template from a cereal packet and used it to hide the timers. Not only was a not clock watching but seemed to find it easier to follow the power targets. You can integrate a video with the workouts. I’ve tried this with the TurboTripping videos and it works really well. My only issue was that with all the numbers on the screen, and trying to match the power and the cadence, it was difficult to get totally immersed. Maybe it’s best to concentrate on the power output and take the recommended cadences as a guide. Each one starts off with a fitness test so that the following sessions are all completed at the correct intensities. You then follow the 6 or 8 weeks of workouts. 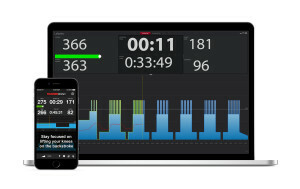 TrainerRoad provides some basic analysis based on Training Stress Score, a list of all your best power outputs for various time intervals, and a Power to Weight graph. Below that is a list of all your workouts. It’s brief and simple and probably all you need to keep a record of your training. If you want more detailed analysis, you can upload to most of the apps (see below). Integration: Strava, Golden Cheetah, Training Peaks etc..
Once your workout is completed it’s saved to the app’s folder so that you can then upload it to Strava, Golden Cheetah, Training Peaks etc. There’s also a button to upload direct to Strava. I uploaded my data to Golden Cheetah without any problems. You can create public or private ‘Teams’ which are for clubs, disciplines, types of trainer or groups of friends. You can pay monthly $12/month or $99 for the full 12 months. If you leave, all your membership data is stored so you just sign up again. After four weeks I found that it added an extra dimension to my training sessions. It made the sessions more accurate and to some extent found it easier to follow the power graph rather than try to match the power numbers. I did find it a more pleasant experience once I covered the timers so that I could conentrate on my power and cadence.